Supporting small scale farmers, especially as they try to adapt to the changing climate, has been identified as the best way to end the scandal of hunger in a Caritas Food Security Study released earlier this year. As part of the study, 98 Caritas organizations around the world were asked the question – “What would be the single most important action that would reduce hunger, malnutrition and food insecurity?” The most common response was around improving agriculture. Around the world, Caritas works with small scale farmers, or family farmers, to provide training, resources and support. The programmes include activities such as training farmers to produce their own fertilizers and pesticides, preserve indigenous seeds, and adapt to challenges posed by climate changes. Small scale farmers feed a large proportion of the world, and if farmers can grow enough to feed themselves, their families and their countries, improvements will follow in other areas, such as health and education. Lalita and her husband Ramesh are family farmers who used to struggle to grow enough food for their family. “Before this project, we’d take loans to buy seeds and fertiliser. Now we don’t have to. We have seeds to eat, sell, and use to plant next season,” says Lalita. “The amount of rainfall received is less than usual. The weather is hotter than usual…” said Mugendi. 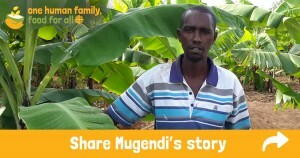 Several years ago, Mugendi was forced to leave his land because of unpredictable weather. 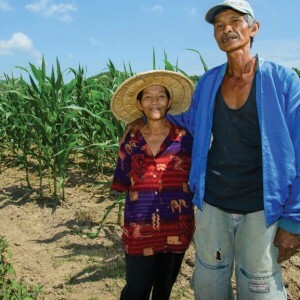 Now, he has been able to return back to farming his land after learning new techniques to adapt to the changing climate. 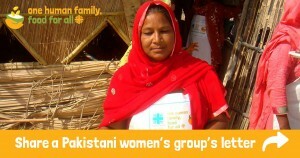 A group of women in Pakistan wrote this letter to other women who are struggling, encouraging them to learn more about Kitchen Gardening, and sharing their own experience. “Now, when there is violence or a strike in Karachi, we can pick home-grown vegetables and cook them for our families and children,” they say.